In this article, I'll demonstrate how to use SQL Provision to create masked copies of multiple databases delivered as a group. Sometimes developer teams need access to a copy of the database containing live data. However, if that database contains sensitive or personal data, then it cannot be used for testing and development work unless all appropriate security measures are in place. The data protection regulations make no distinction between development and production databases, in the event of a data breach. SQL Provision offers a lightweight, low-impact way to create "clones" of SQL Server databases for use in pre-production development and testing workflows. Each clone can be created in seconds, requires very little disk space, and can be consumed like any regular copy of the database. 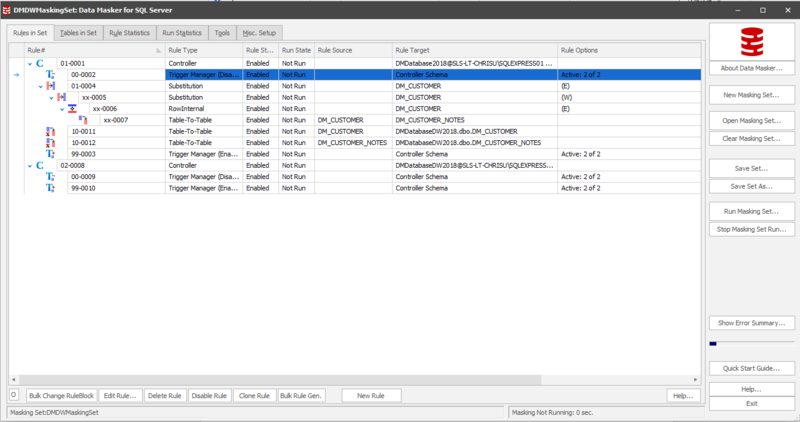 SQL Provision allows users to create custom-defined masking rulesets that will ensure that the data is protected before it is delivered to the pre-production servers. Previous articles have discussed how you can use SQL Provision to create and manage non-production database copies and have demonstrated how to start automating the process of creating a database image with the required masking rules applied during image creation and then distributing "compliant clones." In this article, I'll extend those concepts to demonstrate how you can use SQL Provision to create masked copies of multiple databases delivered as a group, for example, when you are working with a Data Warehouse that contains several cross-database relationships. As a simple example of the problem, let's say we have two databases, DMDatabase2018 and DMDatabaseDW2018. They share the same structure and store the same information except that the former stores only the current year's data and the latter also stores all previous years. We need to deliver these databases to pre-production as a group with the data appropriately and consistently masked in each. How do we achieve this given that SQL Provision can only capture an image of one database at a time with separate masking scripts applied to each? To solve this problem, we'll first have to restore temporary, full copies of each one to a secondary instance of SQL Server so that we can connect to them in a physical location and mask each one consistently. This secondary instance will need to be secure. For example, we'd remove all non-essential permissions to this instance before performing the restore so that we limit any access to PII in any state. The subsequent data masking approach relies on data masker's support for cross-database and table-to-table synchronization rules. These allow us to copy the contents of a table in one database, masked according to the rules defined by the Rule Controller, and update the corresponding rows in a table in another database so that the data is the same in each. Finally, we use SQL Clone to create the images of each of the masked databases and deliver clones of each one to our pre-production server. The approach uses PowerShell to chain together each of the required steps in an end-to-end automated process. At this point, we can run the SQL Scripts to carry out immediately any additional processing of the databases to prepare them for moving into a Dev/Test workflow. For example, we might remove Production level user logins and replace or remap them to the necessary Development permissions and logins. Now, we need to define a single masking set that masks the data in both the DMDatabase2018 and DMDatabaseDW2018 database in the same way. We'll add a rule controller for DMDatabase2018, define the required masking rules, add an additional rule controller for each target database, DMDatabaseDW2018 in this case, and use a Table-To-Table rule to synchronize the masked data from the former to the latter database. In Figure 2, we're using the table-table rules in Rule Block 10 to take the masking rules and synchronize them over to DMDatabaseDW2018. Note the additional Rule Controller for the latter database in Rule# 02-0008. More information on setting up your masking set to connect to multiple schemas can be found here. We can now use PowerShell to call Data Masker via the command line, using the "&" operator, and apply the masking set automatically as soon as the previous restore stage completes. In Listing 1, I piped the output to null, which means that Listing 2 will only kick off once the database restores have completed. Having masked the restored databases, we can create the necessary images of each. We can, of course, do this manually through the SQL Clone dashboard, but again, I prefer to automate the process using the SQL Clone PowerShell cmdlets. Note that in Listing 3 below, I show only the "bare bones" of the code, but you can easily build in your own error handling and so on. $ImageOperation = New-SqlCloneImage -Name "DMDatabase2018"
Figure 3 shows the SQL Clone dashboard with the newly-created images of our obfuscated databases. Finally, we drop the temporary database copies using the sqlps module, then create clones of each image on the required development and test workstations. The approach I described in the article can ensure consistent masking across a group of databases that we need to deliver into development and testing. When we need to query data from multiple sources, we're able to do so in a way that is repeatable, automated, and never compromises on the security of our personally identifiable information. Published at DZone with permission of Chris Unwin , DZone MVB. See the original article here.